KALEIDO, Ideas & Logistics began last Friday, May 16, the process of dismantling and removing the remains of the barge “Prima” grounded on the beach of Reira in Camariñas. 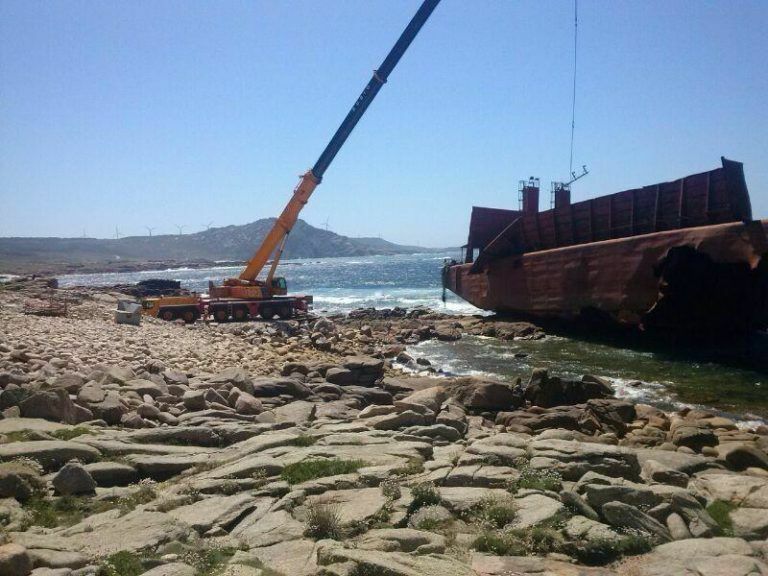 The vessel ran aground on the beach of this municipality of Coruña on 14 January this year as a result of a towing cable breakage on the tug “WEST”. “The phases covering the removal of the barge by KALEIDO range from the preliminary works to the environment delimitation and the dismantling of the barge, through the access land works. We are a global company with extensive experience in operations formed by the most highly qualified professionals and we have the best technical means to develop this work with maximum efficiency and respect for the environment”, said David Puga, agency ship manager at KALEIDO. Specifically, the work plan includes the following actions: preliminary works, preparation of access and platforms, geotextile protection, access and work (cutting) areas land works, dismantling and replacement. In this sense, KALEIDO guarantees that it will restore the area to the situation prior to the works, something that will be verified by expert appraisals. The environmental aspect is key in all actions undertaken by KALEIDO. Thus, to ensure the protection of the environment, the vegetable cover in the access and cutting areas was moved, and the loose rocks on the seacoast were put aside. In addition, a heavyweight geotextile blanket was placed under the intervention areas to protect the natural terrain and mark the area filled in. As for the design of the access and work areas, KALEIDO built two access roads to the area of operations, taking advantage of the existing stone foundation in the part of the coast closest to the barge. At present KALEIDO is dismantling the barge, using specialized equipment for these kind of works and applying the most appropriate cutting techniques in each case, to gradually reduce the remains of the boat to more manageable sizes favoring handling.